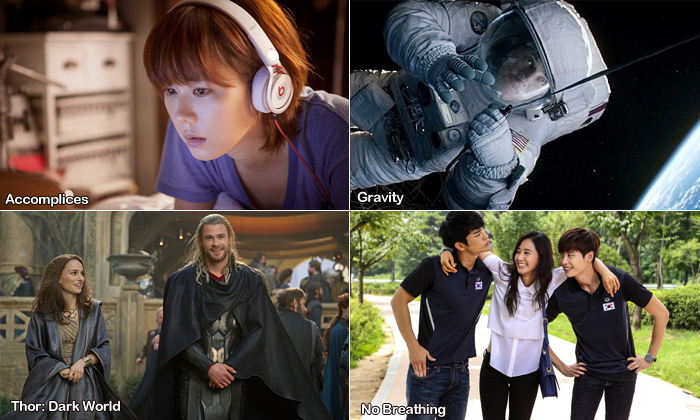 Though seven local films held spots in the top ten over the last fortnight at the Korean box office, some tentpoles almost gave Hollywood the market share edge, as the Korea saw its lead slip down to 51.1% while the United State was right behind with 47.3%, largely based on the strength of holdover Gravity and new release Thor: Dark World. However, with 70% of tickets sold reserved for the top three, there was little variety in the marketplace. Coming out on top was the new Korean entry Accomplices, the debut film of director GUK Dong-seok, starring SON Ye-jin and KIM Kap-soo. In two weeks, the film has accrued just over 1.43 million admissions. The thriller, which tells of a woman who begins to suspect her father of murder, got off to a strong start with a 648,000 admissions weekend but saw its take cut in half by the past weekend, a result of the film’s relatively poor reception from critics and audiences. Moving up to second place in the chart with 1.33 million ticket sales was Alfonso Cuaron’s much ballyhooed Gravity, which has now been out for three weeks. In that time, the impressive space thriller/drama has brought in 2.4 million admissions and a higher than usual revenue of KRW 23 billion (USD 21.68 million) due to strong demand for 3D and IMAX formats. After only a week on release and despite not screening in any CGVs within the Seoul metropolitan area, due to a distribution fee dispite between CJ Entertainment and Sony Pictures Releasing, Marvel’s Thor: Dark World was able to clinch third place with 1.27 million admissions. The Hollywood blockbuster won the recent weekend at the box office with 827,000 admissions. At number four but with a significantly lower 334,000 tickets sales was one-week old Korean release No Breathing, the debut film of JO Yong-seon starring LEE Jong-suk. The sports drama has been unable to capture the imagination of filmgoers. Dropping to number five was JANG Joon-hwan’s comeback film (following 2003’s Save the Green Planet), the dark thriller Hwayi: A Monster Boy, starring YEO Jin-gu and KIM Yun-seok. The film added 332,000 admissions to its four-week take, which now stands at 2.39 million. Following a strong start the film was unable to overcome stiff competition and perhaps a reluctance on the part of viewers to go and see it when word spread of its morbid nature. 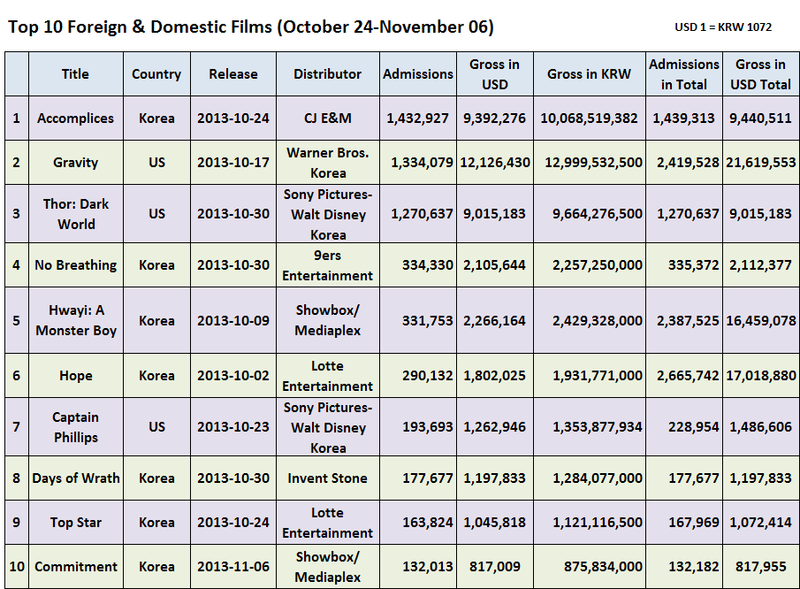 In the rest of the top ten, LEE Joon-ik’s Hope added 290,000 to its strong 2.67 million admissions total, Tom Hanks based-on-a-true-story thriller Captain Philips was barely afloat with 194,000 admissions. Further down, new Korean revenge thriller Days of Wrath and PARK Joong-hoon’s directorial debut Top Star each failed to break into the market with 178,000 and 164,000 admissions, respectively. Commitment, which was officially released on November 6th, squeaked into the top ten with 132,000 worth of sneak previews. The KIM Ki-duk produced Rough Play also had a tough time out the gate as it has only managed to attract 109,000 viewers in two weeks. In limited release the sixth entry in the If You Were Me omnibus series, which has been commissioned by the National Human Rights Commission of Korea, took just shy of 18,000 admissions after two weeks on release. The documentary sequel Talking Architect: City Hall, from director JEONG Jae-eun, managed to draw 3,265 spectators to theaters. Over the next two weeks there don’t seem to be any major contenders from Hollywood while on the domestic side of things, a trio of new releases will be looking to bow to strong numbers. Those include the CHOI Seung-hyun (aka T.O.P) action-drama Commitment, KWAK Kyung-taek’s Friend: The Great Legacy, the sequel to his 2001 gangster hit, and the webtoon-adapted revenge thriller The Five.